“Love is in the air”, or so the song goes – which leads us to the question, have you gotten something for your other half this coming Valentine’s Day? If your blood froze when you heard the words “Valentine’s Day”, fret not – we know that boffins are notorious when it comes to forgetting anniversaries, birthdays and special occasions. Well, if you have run out of ideas as to what to purchase for your other half, how about this red Nextbook that will feature a special offer from VUDU, where you can pick from five movies for free as well as $5 credit that can be used for any rental. 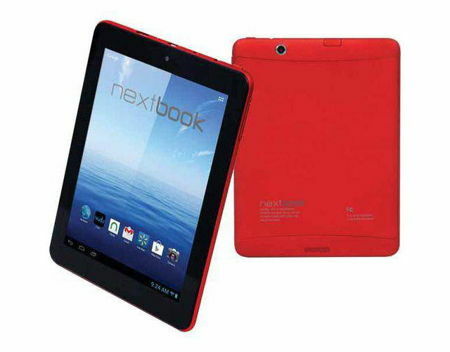 This 8” Nextbook Android tablet comes in a special shade of red just in time for Valentine’s Day. It will run on Android 4.1 Jelly Bean as the mobile operating system of choice, and if you are interested in picking it up, it ought to be readily available at select Walmart stores nationwide as well as over their website, Walmart.com. Apart from that, the Nextbook Premium 8HD will also boast of Google Play and preloaded Android apps from Google, in addition to the Barnes and Noble NOOK for Android app. Other hardware specifications include a dual-core processor and 8GB of internal memory, dual webcams, an HDMI-out port, a USB 2.0 port, and a microSD card slot. The asking price? $99 a pop. That ain’t too shabby for what seems to be an entry level tablet, don’t you think so?